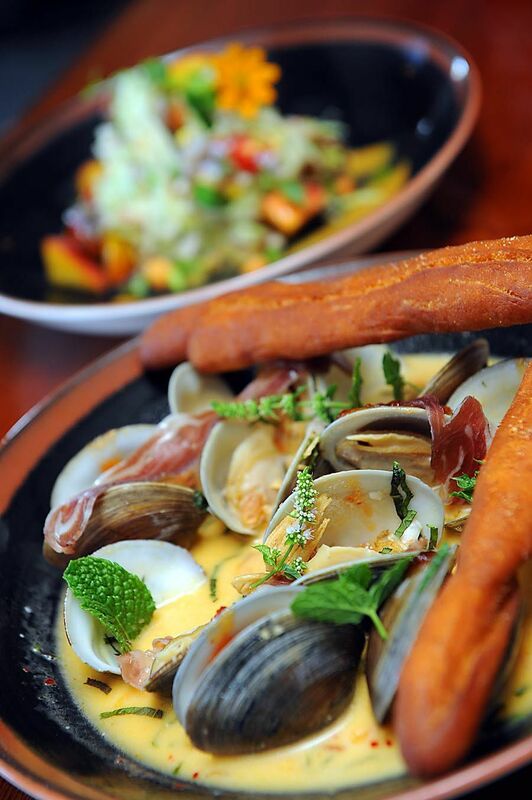 MoPho's menu, which takes a gourmet approach to traditional Vietnamese dishes, was an immediate hit in its Mid-City neighborhood, and earlier this month the restaurant was nominated as one of Bon Appetit's Best New Restaurants. Chef Michael Gulotta (former chef de cuisine at Restaurant August) has constructed a restaurant that's both a casual drop-in spot and a place for a special meal. Make your own pho (pick a broth and add your own ingredients) or go for favorites like crispy lemon grass chicken wings or fried shrimp spring rolls. (If they've roasted a whole pig on the patio, as they often do, don't miss it.) Sandwiches (hot sausage, duck, oysters, and quite a few more) meld hearty po-boy flavors to lighter banh mi tastes. Cocktails are solid, too; the Tamarind Sour melds rye whiskey to tamarind, while the Dragon Lady starts with housemade dragonfruit tequila. Tip: Watch where you park; the adjoining lot can and does tow with ferocious frequency. If there are balloons on every other table, it's because Commander's is as much a party as a restaurant. 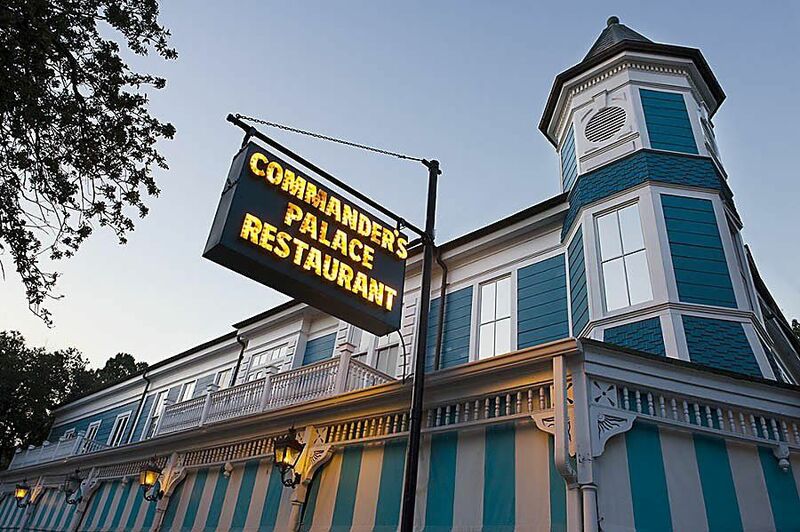 A warren of individually decorated rooms (the Garden Room is the best) in a turquoise wedding-cake palace, Commander's manages to be both New Orleans classic and completely up-to-date. Chef Tory McPhail, winner of a 2013 James Beard Award, turns rustic ingredients into modern takes on Creole cuisine: lacquered quail, Cajun-inflected gumbo and the freshest fish in town. If you have guests from out of town, let them get dazzled by the service — and ask for a tour of the restaurant (which includes the kitchen) when you're done with your meal. Pro tips: If you're celebrating a special occasion, let the restaurant know when you make your reservation, and if you'd like to meet Lally Brennan or Ti Martin, the restaurateurs who keep Commander's running like a top, ask your server. They enjoy meeting guests. The Bywater barbecue joint takes the top spot for a fifth year in a row. In 2012, it moved to its current location on Mazant Street, and its beloved smoker was given a second-line parade on its way to its new home. The Joint's menu is an amalgamation of slow-smoked Southern barbecue, with St. Louis-style pork ribs, Carolina pulled pork, Texas brisket and Louisiana-made chaurice sausage. It returns from its summer break Sept. 6. The reigning king of New Orleans burgerdom tops Best of New Orleans for the third year in a row. Chef Adam Biderman's spartan Freret Street diner's namesake cheeseburger — two house-ground patties, bread and butter pickles, thinly sliced onions and American cheese on a brioche bun — is routinely hailed as one of America's best by national publications. Leah Chase's landmark restaurant is a vital Creole food spot, a living history lesson and a gallery of contemporary African-American art. Much of the New Orleans civil rights movement was planned and discussed over bowls of gumbo and plates of greens here, and Chase herself was the impetus for turning what was a blue-plate special restaurant (the Globe Sandwich Shop) into a place of fine dining for black New Orleanians who couldn't get served at the city's white-tablecloth establishments. Since then, Chase has taught Julia Child how to fry chicken, presidents make campaign stops at her restaurant, and Chase inspired the Walt Disney Company's first African-American princess (Tiana of The Princess and the Frog). Lunch at Dooky Chase on Holy Thursday is an important ritual for many, who come to eat the restaurant's gumbo z'herbes (green gumbo). Making a reservation far in advance is essential. If you've never been to Dooky Chase, a good introduction is the Friday all-you-can-eat lunch buffet ($17.95), which features Chase's fried chicken, gumbo, greens and other soul-kitchen favorites. Every New Orleans neighborhood should have a place like Katie's in Mid-City, where you can stop in any time — dressed down or dressed up — for a simple burger or pizza, or opt for a more elaborate meal. Destroyed in the floods after Hurricane Katrina, it took Katie's almost five years to get up and running. Seafood beignets, blackberry-jalapeno ribs, catfish meuniere, soft-shell crabs and "The Barge" (an entire loaf of Gendusa bread crammed with fried seafood) are just a few of the items on the extensive menu, but some of the best food is transitory, coming and going on the specials board. There's also a full bar and some sidewalk seating. Food Network personality Guy Fieri spotlighted Katie's on Diners, Drive-Ins and Dives, but it's really none of the three — just an exemplar of what a New Orleans neighborhood restaurant can be. Waiting in a long line that rounds the block in the middle of summer might seem like drudgery, but the ice — shaved with the same type of machine Ernest Hansen invented in 1939 and topped with homemade syrups — is well worth it. A collection of faded photographs taken during Hansen's 75-year history gives customers something to while away the time and illustrates the sno-ball stand's most recent accolade: An "American Classic" designation from the James Beard Foundation. The lingering effects of even the roughest night can be cured with The Ruby Slipper's migas or eggs cochon, and some hair of the dog is offered in the form of sangria, mimosas, bloody marys and more. The New Orleans City Council passed legislation in July 2013 to allow for more mobile food vendors in the city. Taceaux Loceaux has been "locking tires and lighting fires" since 2010, when Alex and Maribeth del Castillo started slinging hefty, creative tacos in picnic-striped paper serving trays. Tacos are loaded with brisket, Korean barbecue, carnitas and other specials, and there also are avocado "fries." Find the truck by following it on Twitter. Louisianans know gumbo isn't just a meal, it's a ritual — the family recipes closely held, the meditative and prolonged stirring of the roux, the "Holy Trinity" (chopped celery, bell peppers and onions). So restaurateurs who approach the dish with anything less than total reverence are considered infidels. On the other hand, those who lavish appropriate care on this dish are rewarded with the undying loyalty of the faithful. Case in point: Gumbo Shop, which readers votes Best Gumbo for the 16th consecutive year. Customers can gobble gumbo by the bowl in the restaurant or by the gallon in containers that ship nationwide. And for the most die-hard devotees, the circa-1948 stalwart offers a seafood gumbo recipe that sheds light onto its time-consuming, meticulous preparation process: start cooking "early in the day," the recipe advises. There's a page devoted to the roux alone. Mais oui! 626 S. Carrollton Ave., (504) 309-2679 Pieces of pecan pie are crisped in the leftover sizzle of salty cheeseburgers. Pair both cheeseburger and pie with a chocolate freeze, chat it up with the diners sitting at the communal counter next to you and be reborn for your late-night dalliance. After years of dining at restaurants where vegan entrees are an afterthought at best and nonexistent at worst (hello, plain baked potato), New Orleans vegans have a place where the entire menu is their oyster... er, seaweed salad. And what a place. This light-filled, high-ceilinged bistro in the Lower Garden District offers a fresh, clean backdrop for a procession of gorge-worthy comfort food classics (eggplant po-boys, Southern fried tofu nuggets, chocolate chip cookies) made from local, organic ingredients. With gluten-free, soy-free and raw offerings, the plant-based menu is appropriate for a variety of specialized diets. Even staunch carnivores are likely to be won over by the hearty barbecue sandwich and nachos, or at least their health-conscious sides will be. Top off a meal with a raw carrot cupcake and a fresh juice cocktail (almond milk punch blends bourbon, almond milk, vanilla, maple syrup and nutmeg) — gluttony has never been so virtuous. The secret's been out for a while — as Bacchanal's frequent standing-room only crowds, celebrity guests and multiple BONO wins will attest. But a visit to the wine shop/gastropub/jazz club still feels like crashing a cool backyard party. There's the clandestine entrance through a weathered wine shop that's feels like a cellar but isn't underground; the overgrown courtyard full of rickety lawn chairs, mismatched tables, tiki torches and strings of white lights; the walk-up kitchen window. Still, they've spruced up the place since going legit with food and music permits: There's a second-floor dining room, craft cocktails, beer and small plates by chef Joaquin Rodas designed to unlock the somewhat esoteric flavors of the shop's Old World European wines. Perhaps best of all, Bacchanal now accepts credit cards, but you'll still want to bring cash to throw in the musicians' tip jar. That's keeping it real. Sometimes Sucre's macarons seem too pretty to eat, but only sometimes. The pearly cookies, which come in flavors like PB&J, bananas Foster and chicory, are just a corner of the confectioner's menu, which includes dozens of sweets just as easily mistaken for jewelry. The grumpiest bear in all the land of deli meat, Dan Stein opened this Jewish and Italian deli in 2007, and it's a perennial favorite of Best of New Orleans voters. The Philly native's aromatic, beer-lined Garden District deli offers expert-level hoagies, Reubens, pastrami sandwiches and other oversized odes to meat. There are a million kinds of po-boys, but only one kind of real muffuletta — Italian ham and salami, mortadella and/or provolone, served with olive salad on a round seeded bun. Nevertheless, they all somehow taste different. Why? Who knows. If location has something to do with it, it would explain the eternal popularity of the muff from Central Grocery. You pick up a premade sandwich wrapped in paper (a quarter? a half? a whole?) and pay for it at a time-warp Italian grocery counter, waiting in line with tourists, half of whom seem to be buying one for the plane ride home. Then comes the question: where to enjoy it? On a bench in Jackson Square with a cold beer? On the levee overlooking the river with a Barq's? Either way you'll be juggling the sandwich, trying to keep the big chunks of olives from falling out and, likely, picking them up off your lap and popping them in your mouth. Yeah, it's that good.